Jeremy Hill (born October 20, 1992) is an American football running back who is a free agent. He was drafted by the Cincinnati Bengals in the second round of the 2014 NFL Draft. He played college football at Louisiana State University (LSU). A native of Baton Rouge, Louisiana, Hill attended Redemptorist High School, where he was a three-sport athlete in football, baseball, and track. In football, Hill was an All-American running back for the Wolves. He was a teammate of future LSU offensive lineman La'el Collins. He finished his senior season in 2010 with 302 carries for 2,260 yards and 36 touchdowns. Regarded as a four-star recruit by the Rivals.com recruiting service, Hill was listed as the No. 21 running back prospect in his class. Hill attended Louisiana State University, where he played for head coach Les Miles in the 2012 and 2013 seasons. As a freshman in the 2012 season, Hill was an instant contributor. He combined with Spencer Ware, Kenny Hilliard, Michael Ford, Alfred Blue, and Russell Shepard to form one of the stronger rushing attacks in the SEC. On September 15, 2012, Hill had 10 rushes for 61 yards and his first two collegiate touchdowns against Idaho. On September 15, Hill had 10 rushes for 61 yards and his first two collegiate touchdowns against Idaho. On October 6, in his first game in conference play, he had only two rushes for eight yards against Florida in their annual rivalry game. One week later, on October 13, he had 17 rushes for 124 yards and two touchdowns in a breakout performance against South Carolina. He followed the South Carolina game with another stellar performance on October 20, when he had 18 rushes for 127 yards and a touchdown against Texas A&M. He recorded his third consecutive game with at least 100 rushing yards on November 3, when he had 29 rushes for 107 yards and a touchdown against Alabama in their annual rivalry game. On November 17, he had 20 rushes for 77 yards and a career-high three touchdowns against Mississippi. On December 31, in the 2012 Chick-fil-A Bowl, he had 12 rushes for 124 yards and two touchdowns against Clemson. Overall, in his freshman season, Hill had 142 rushes for 755 yards and 12 touchdowns. As a sophomore in 2013, Hill had a stellar season. Veterans Hill, Blue, and Hilliard and newcomer Terrence Magee formed a strong rushing attack for the Tigers in the 2013 season. In the season opener on September 7, he had six rushes for 50 yards and a touchdown against Alabama-Birmingham. The next week, he followed that up with 11 rushes for 117 yards and two touchdowns against Kent State. On September 21, he had 25 rushes for a career-high 184 yards and three touchdowns against eventual SEC champion Auburn. A few weeks later on October 12, he had 19 rushes for 121 yards against Florida. On October 26, he had 14 rushes for 143 yards and two touchdowns against Furman. On November 29, in his last regular season game with the Tigers, Hill had 20 rushes for 145 yards and a touchdown against Arkansas. On January 1, 2014, he had 28 rushes for 216 yards and two touchdowns against Iowa in the 2014 Outback Bowl. He was named MVP of the bowl game following his great performance against the Hawkeyes. Overall, in his last season with the Tigers, Hill had 203 rushes for 1,401 yards and 16 touchdowns. Hill was a first-team All-Southeastern Conference (SEC) selection. The Cincinnati Bengals drafted Hill in the second round, with the 55th overall pick, of the 2014 NFL Draft. He was the second running back to be selected in the 2014 NFL Draft. The only one drafted ahead of Hill was Bishop Sankey, who went one pick earlier to the Tennessee Titans. In addition, he was the third of nine LSU Tigers to be selected that year. On May 25, 2014, Hill signed his rookie contract, a four-year, $3.71 million contract with $1.64 million guaranteed. Hill entered the regular season as the Cincinnati Bengals' backup running back behind second year player Giovani Bernard. Hill made his professional regular season debut in the Cincinnati Bengals' season opener against the Baltimore Ravens on September 7, finishing with four carries for 19 rushing yards. The following week, he rushed for 74 yards on 15 rushing attempts and scored his first career touchdown on a one-yard run in the third quarter of the Bengals' 24–10 victory over the Atlanta Falcons. In addition, he made his first career reception during the game, finishing with two catches for 22 receiving yards. On October 5, Hill caught three passes for a season-high 68 yards during a 17–43 loss to the New England Patriots. On November 2, he earned his first career start during a victory over the Jacksonville Jaguars and finished with a total of a season-high 154 yards and two touchdowns. In Week 11, Hill had a season-high 27 carries for 152 rushing yards in a 27–10 victory over the New Orleans Saints. On December 14, he ran for 148 yards and two rushing touchdowns in the 30–0 victory over the Cleveland Browns to earn AFC Offensive Player of the Week honors. On December 22, Hill ran for 147 rushing yards on 22 carries and a touchdown, including a career-long 85-yard touchdown run in the first quarter victory over the Denver Broncos. The following week, he had 23 carries for 100 rushing yards in a 17–27 loss to the Pittsburgh Steelers. This marked Hill's fifth 100-yard performance and third straight. Hill finished his rookie season with 222 carries for 1,124 rushing yards and nine rushing touchdowns. In addition, Hill accounted for 22 receptions for 215 receiving yards and appeared in a 16 of the Bengals' regular season games while starting nine. He became the first Bengals' rookie to top 1,000 yards rushing since Corey Dillon in 1997. His 1,124 rushing yards was the most among rookies and eighth-most in the NFL. His 5.1 yards per carry average ranked him second among NFL running backs, behind Justin Forsett of the Baltimore Ravens. He was named to the All-Rookie Team for his 2014 season. 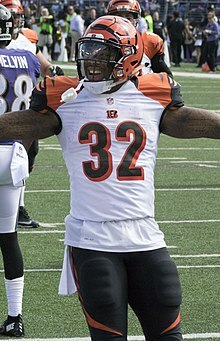 On January 4, 2015, Hill played in his first career playoff game and had 23 carries for 47 rushing yards, while scoring the Bengals' lone touchdown in a 26–10 loss to the Indianapolis Colts in the AFC Wild Card Round. Hill started his second season as the Cincinnati Bengals' starting running back, ahead of Giovani Bernard on the depth chart. Hill started the Bengals' season opener against the Oakland Raiders and had 19 carries for 63 rushing yards and two touchdowns as the Bengals won by a score of 33–13. The following week, he was benched in favor of Giovanni Bernard after fumbling twice against the San Diego Chargers. He finished the game with only 10 carries for 39 rushing yards as Bernard ran for 123 yards, helping the Bengals win by a score of 24–10. On October 4, 2015, Hill had nine rushing attempts for 40 rushing yards and a career-high three touchdowns as the Bengals defeated the Kansas City Chiefs 36–21. In Week 6, Hill had 16 carries for 56 rushing yards and caught his first career touchdown reception on a 13-yard pass from quarterback Andy Dalton, as the Bengals defeated the Buffalo Bills. On December 6, 2015, Hill ran for a season-high 98 yards on 22 carries and a touchdown in the Bengals' 37–3 victory over the Cleveland Browns, his eighth touchdown of the season. The play that Hill will likely be remembered for during his time in Cincinnati occurred on January 9, 2016. He ran for 50 yards on 12 carries and a touchdown in the Bengals' AFC Wild Card Round game against the Pittsburgh Steelers. With a little over one minute remaining and needing only to down the ball to run the clock out and break a 25 year playoff victory drought Hill fumbled the ball on the Pittsburgh one yard line, leading to a Steelers' recovery and 18–16 victory after the Bengals took a 16–15 lead with less than two minutes remaining in the game and got the ball back on a Vontaze Burfict interception. Hill finished the 2015 season with 794 yards on 223 rushes for an average of 3.6 yards per carry. He finished the season tied with Devonta Freeman of the Atlanta Falcons, Adrian Peterson of the Minnesota Vikings, and DeAngelo Williams of the Pittsburgh Steelers for most rushing touchdowns in the NFL with 11. In the Bengals' season-opener on September 11, Hill had nine rushing attempts for 31 rushing yards and a touchdown in a 23–22 victory over the New York Jets. On September 25, he had 17 carries for 97 yards and a season-high two touchdowns in a 17–29 loss to the Denver Broncos. Hill's performance against the Broncos marked his seventh career game with multiple rushing touchdowns. On October 23, Hill had nine carries for a career-high 168 rushing yards and a touchdown in a 31–17 defeat of the Cleveland Browns. His touchdown came on a season-high 74 yard run. The following week, Hill ran for 76 yards on 20 carries and a touchdown against the Washington Redskins. On December 11, Hill had 25 carries for 111 rushing yards and a touchdown in a win over the Cleveland Browns. Hill finished the 2016 season with 839 yards and nine touchdowns on 222 carries. Hill entered the 2017 season as the Bengals' lead back ahead of Giovani Bernard and rookie Joe Mixon. He started the first seven games, however he was overshadowed by the highly acclaimed Mixon, who amassed more than twice as many carries as Hill in seven games. He was placed on injured reserve on November 11, 2017 with an ankle injury, ending his season. Overall, he finished with 37 carries for 116 yards and four receptions for 16 yards. On March 17, 2018, Hill signed a one-year $1.5 million contract with the New England Patriots. Throughout training camp and the preseason, Hill competed primarily with Mike Gillislee as the team's power back. He won the job after an impressive preseason and was named the third running back on the depth chart behind Rex Burkhead and James White. In Week 1 against the Houston Texans, Hill exited the game in the third quarter after suffering an apparent knee injury. He was diagnosed with a torn ACL and was ruled on the injured reserved that year, being placed on injured reserve on September 10, 2018. the Patriots reached Super Bowl LIII where they defeated the Los Angeles Rams 13-3. ^ "Jeremy Hill College Stats". College Football at Sports-Reference.com. Retrieved March 21, 2018. ^ "2012 LSU Fighting Tigers Stats". Sports Reference. Retrieved September 5, 2017. ^ "Idaho at Louisiana State Box Score, September 15, 2012". Sports Reference. Retrieved September 5, 2017. ^ "LSU at Florida Box Score, October 6, 2012". Sports Reference. Retrieved September 5, 2017. ^ "South Carolina at Louisiana State Box Score, October 13, 2012". Sports Reference. Retrieved September 5, 2017. ^ "LSU at Texas A&M Box Score, October 20, 2012". Sports Reference. Retrieved September 5, 2017. ^ "Alabama at Louisiana State Box Score, November 3, 2012". Sports Reference. Retrieved September 5, 2017. ^ "Ole Miss at Louisiana State Box Score, November 17, 2012". Sports Reference. Retrieved September 5, 2017. ^ "Chick-fil-A Bowl - LSU vs Clemson Box Score, December 31, 2012". Sports Reference. Retrieved September 5, 2017. ^ "Jeremy Hill 2012 Game Log". Sports Reference. Retrieved September 5, 2017. ^ "2013 LSU Fighting Tigers Stats". Sports Reference. Retrieved September 5, 2017. ^ "UAB at Louisiana State Box Score, September 7, 2013". Sports Reference. Retrieved September 5, 2017. ^ "Kent State at Louisiana State Box Score, September 14, 2013". Sports Reference. Retrieved September 5, 2017. ^ "Auburn at Louisiana State Box Score, September 21, 2013". Sports Reference. Retrieved September 5, 2017. ^ "Florida at Louisiana State Box Score, October 12, 2013". Sports Reference. Retrieved September 5, 2017. ^ "Furman at Louisiana State Box Score, October 26, 2013". Sports Reference. Retrieved September 5, 2017. ^ "Arkansas at Louisiana State Box Score, November 29, 2013". Sports Reference. Retrieved September 5, 2017. ^ "Outback Bowl - Iowa vs Louisiana State Box Score, January 1, 2014". Sports Reference. Retrieved September 5, 2017. ^ "Outback Bowl News". Outback Bowl. January 1, 2014. Retrieved September 5, 2017. ^ "Jeremy Hill 2013 Game Log". Sports Reference. Retrieved September 5, 2017. ^ Hanzus, Dan (May 9, 2014). "Jeremy Hill drafted 55th by Cincinnati Bengals". NFL.com. Retrieved October 31, 2016. ^ "2014 NFL Draft Listing". Pro-Football-Reference.com. Retrieved September 5, 2017. ^ Maquinana, Ryan (March 27, 2016). "Jeremy Hill signs rookie deal with Cincinnati Bengals". NFL.com. Retrieved December 24, 2016. ^ Overthecap.com. "Jeremy Hill Contract Details, Salary Cap Charges, Bonus Money | Over The Cap". Over the Cap. Retrieved December 24, 2016. ^ "Ourlads.com: Cincinnati Bengal's Depth Chart". ourlads.com. Retrieved December 29, 2016. ^ "Cincinnati Bengals at Baltimore Ravens - September 7th, 2014". Pro-Football-Reference.com. Retrieved September 5, 2017. ^ "Atlanta Falcons at Cincinnati Bengals - September 14th, 2014". Pro-Football-Reference.com. Retrieved September 5, 2017. ^ "Cincinnati Bengals at New England Patriots - October 5th, 2014". Pro-Football-Reference.com. Retrieved October 31, 2016. ^ a b "NFL Player Profile: Jeremy Hill". NFL.com. Retrieved December 29, 2016. ^ "Cincinnati Bengals at New Orleans Saints - November 16th, 2014". Pro-Football-Reference.com. Retrieved September 5, 2017. ^ "Cincinnati Bengals at Cleveland Browns - December 14th, 2014". Pro-Football-Reference.com. Retrieved March 21, 2018. ^ "2014 NFL Week 15 Leaders & Scores". Pro-Football-Reference.com. Retrieved March 21, 2018. ^ "Jeremy Hill and Bengals run past Broncos". ESPN. December 23, 2014. Cincinnati's Jeremy Hill ran for 147 yards, the most by any player against Denver that season. He became the fourth Bengals rookie to rush for 1,000 yards and the first since Corey Dillon in 1997. ^ Kirkendall, Josh (December 29, 2014). "Bengals crushed by turnovers and Hill just misses". Cincy Jungle. Retrieved October 31, 2016. ^ "Jeremy Hill 2014 Game Log". Pro-Football-Reference.com. Retrieved September 5, 2017. ^ Criswell, Josh (July 13, 2015). "Rookie recap: Cincinnati Bengals RB Jeremy Hill". Death Valley Voice. Retrieved October 31, 2016. ^ "2014 NFL Rushing & Receiving". Pro-Football-Reference.com. Retrieved September 5, 2017. ^ "2014 NFL All-Rookie Team". Pro-Football-Reference.com. Retrieved March 21, 2018. ^ Hobson, Geoff (January 4, 2015). "Colts banish Bengals". Retrieved October 31, 2016. ^ "Ourlads.com: Cincinnati Bengal's 2015 Depth Chart". ourlads.com. Retrieved December 29, 2016. ^ Kirkendall, Josh (September 13, 2015). "Bengals crush Raiders, 33-13". Cincy Jungle. Retrieved October 31, 2016. ^ a b Marcum, Jason (September 20, 2015). "Gio Bernard takes over as Jeremy Hill gets benched". Cincy Jungle. Retrieved October 31, 2016. ^ "Jeremy Hill silences fantasy football critics, powers Bengals to victory". ESPN.com. Retrieved October 31, 2016. ^ "Cincinnati Bengals at Buffalo Bills - October 18th, 2015". Pro-Football-Reference.com. Retrieved September 5, 2017. ^ Cosenza, Anthony (December 6, 2015). "Don't look now, but Jeremy Hill is heating up". Cincy Jungle. Retrieved October 31, 2016. ^ "Steelers Ryan Shazier forces Bengals Jeremy Hill fumble". NFL.com. Retrieved October 31, 2016. ^ "2015 NFL Rushing & Receiving". Pro-Football-Reference.com. Retrieved September 5, 2017. ^ Toback, Rebecca (September 12, 2016). "Jeremy Hill shaking hands instead of busting moves". Cincy Jungle. Retrieved October 31, 2016. ^ Chisenhall, Jeremy (September 25, 2016). "Jeremy Hill bounces back in loss to Broncos". Cincy Jungle. Retrieved October 31, 2016. ^ Marcum, Jason (October 24, 2016). "Hill finally has massive game we've all been waiting for". Cincy Jungle. Retrieved October 31, 2016. ^ "Bengals' Jeremy Hill: Touchdown Sunday in tie with Redskins". CBSSports.com. October 30, 2016. Retrieved October 31, 2016. ^ Hobson, Geoff (December 11, 2016). "Bengals run down Browns, 23-10". Retrieved December 17, 2016. ^ "Jeremy Hill 2016 Game Log". Pro-Football-Reference.com. Retrieved September 5, 2017. ^ Goodberry, Joe (September 13, 2017). "The Bengals need to make a decision at running back". Bengals Wire. Retrieved November 14, 2017. ^ Hobson, Geoff (November 11, 2017). "Late moves: Hill goes to IR; Bullock OK; Tupou, Wilson promoted". Bengals.com. ^ "Jeremy Hill 2017 Game Log". Pro-Football-Reference.com. Retrieved November 14, 2017. ^ "Patriots Sign Three Free Agents". Patriots.com. March 17, 2018. ^ Patra, Kevin (September 10, 2018). "Patriots RB Jeremy Hill (ACL) out for the season". NFL.com. ^ "Super Bowl LIII - Los Angeles Rams vs. New England Patriots - February 3rd, 2019". Pro-Football-Reference.com. Retrieved March 15, 2019. ^ Auzenne, Josh. "Jeremy Hill pleads guilty to lesser charge, gets probation". Retrieved October 31, 2016. ^ "Suspended LSU RB Jeremy Hill pleads guilty to simple battery". Retrieved October 31, 2016.